I'm also very pleased about the base: I used plaster and real rocks, together with sand, fine flock, real branches and some dried grass. The pictures also turned out pretty well. First of all: what's a wet palette? It's used to keep paint from drying. It gives you more time to work with the same mix, or simply to keep the paint wet when working in dry environments (for example outside). I don't use a wet palette that much. Sometimes when the weather is nice and I want to paint outside or when I create a mix which I want to use during a long painting session. No matter how much you use it: it's a great tool, and it's cheap too! 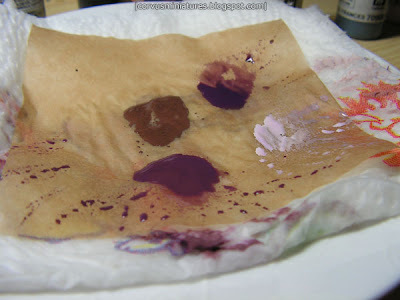 I'm amazed that some companies ask more than €10 for a wet palette when you can make one yourself for less than 1 cent. 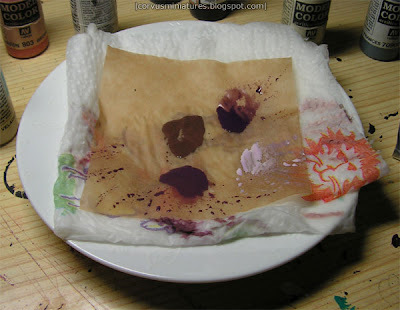 The materials you need are a small dinner plate, some paper towel and baking paper (I use brown, but I guess white works just as good). Take two sheets of paper towel, fold it two times so that it first on the plate and hold it under the water tap. Soak it, but not too much so that there's a pool of water on top of the towel when you put it on the plate. Cut a piece of baking paper so that it fits on top of the plate and put it on the wet paper towel. I've added the 'Follow me' gadget on the sidebar to the right. By clicking the white follow button you can follow my new posts with one of the services provided by Google Friend Connect, for example blogger dashboard (if you have a blog yourself) or Google Reader. It would be cool if you decided to follow my blog if you want to keep up to date with the latest posts here or if you simply like my work, even if you don't want to follow me by using one of the Google services. It's a great way of telling me you appreciate my work and as a bonus you get some free advertisement for your own blog or profile because your portrait and link is included in the gadget when you decide to follow. Remember I'm on Twitter too: twitter.com/corvusminis. Finished the filigree and other light bits on the armour. Took quite a while to get right, but I'm very happy about the result. Work continues on the Drune and I'm really enjoying painting a Rackham figure again. Finished the robes a few days ago, and today I worked on the armour a bit. At first I wasn't really happy with the color of the robes: it looked too similar to the skintone, but now that the armor is having its basecoat it actually looks quite balanced. Empire Amethys Wizard by Mr F - Smooth, clean painting and perfect up to the finest details. Boss Snikrot by camelson - Nice paintjob with a muted colorscheme but at the same time a lot of contrast. Terezinya and Familiar by Ickthorne - The black rocks together with the dead leaves and grass offer a lot of contrast. Good idea! Nurgle Blight Drone by akaranseth - Gruesome piece of work with some great effects. Legion Commander by Bobinator - Best flame painting ever. Daemon Hunter Inquisitor Lord by RAFFY10 - Nicely done armour and great metallics. Krieg Command Squad by Arsies - Gold in the 40K unit category of Golden Demon Spain 2009. 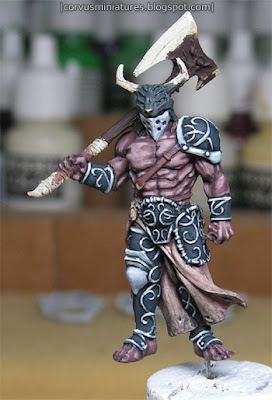 Red Karnagh by Landreth - The base is great but the painting is even better. ORCombinator by Artur - An Orc in Terminator armor. Assassin Fiday by Random Factory - One of my favorite Infinity miniatures in a splendid paintjob. 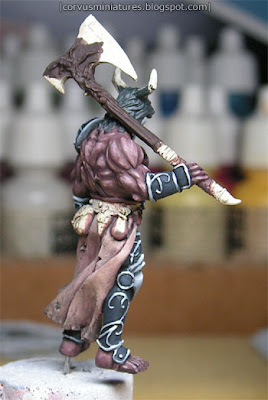 Tanath by Kurts - Great way to honor this classic Rackham mini. The Explorer by paloji - Another GD Spain winner, great setting. The Headhunter by Crackpot - One more figure with a great setting, remember Cadwallon? 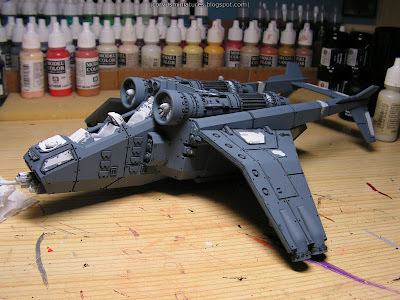 Cadian Navy Valkyrie by Hortwerth - This is why the base of the Valkyrie is so big. I've been considering to paint this figure since the day it came out, but I think it's too much monotonous work to paint it in one go. Maybe when I finish my Valkyrie I should take it in consideration once again. I'm still working on the Imperial Valkyrie, but it's monotonous work. Basecoating and shading is finished on the entire model, so I promised myself a small reward when I got that far. So I looked into my closet containing unpainted miniatures (good luck there aren't too many of them) and noticed this old Rackham figure lying around: a Red Karnagh from the Drune army. I realized it's been more than 2,5 years since I last painted a Rackham mini. A shame really, since it's the manufacturer which dragged me deep into the mini painting hobby... I'm still a great fan of the figures. Anyway I want to show you what I'm working on. 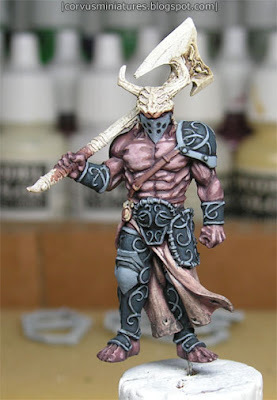 I'm going for an alternative skin tone here: some red-brown was mixed in the base coat, together with a touch of violet. 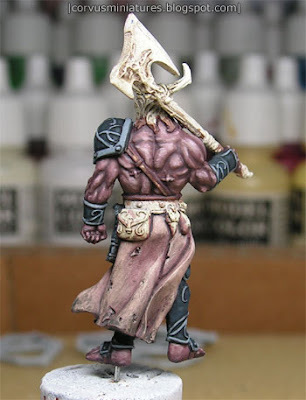 Shading was done by mixing in more brown and violet, for the highlights I used light flesh with some pink mixed in. I finished the skin with a glaze of the basecoat with some extra violet. I'm not 100% happy with the final result, some highlights are a bit too rough (like on the chest) but some areas look pretty decent (left arm and hand). I added a link to my gallery to the menu on the right, but it's still work in progress actually. After uploading some WIP and finished pictures and event coverages it's somewhat taking shape, but it's still quite empty to serve as a representative portfolio of my work. The plan is to upload some of my older pictures. Not all of them because there's a lot of poor quality paintjobs and photos among them, but just some highlights. You will notice some watermarks on the pictures which point to my older sites (the original Corvus' Miniatures and Pendragon Studios). I could go to the process of photographing all miniatures again, but this would be too time consuming. And my photo setup hasn't improved over the years so apart from the old watermarks there isn't really much value added. Anyway let's start off with some highlights of my first attempts to paint something decent, done in 2004. I did some 40k that year but I was mainly working on my Confrontation Drune army back then. I also did some other stuff like painting the Hybrid board game set as a commission. If you ask me what's my favorite it would be tough choice: I'm very proud of Celestine, it's my first paintjob which won prizes at multiple painting competitions. The Tau Devilfish is also a nice piece, but I would probably go for the Karnagh Drunes. They really reflect the atmosphere of the entire army very well, and they are representative for the quality level of my gaming figures back then. 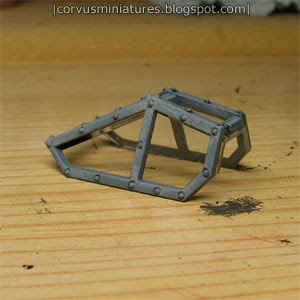 I was also quite skilled NMM (non-metallic metals) at that time. Inge Mygind Jensen , better known by her nickname 'Jenova' is back. Her site has been inactive for last 4 years, but for some reason I kept coming back, waiting for an update. Yesterday evening I visited her site to check out an old tutorial I wanted to read and I noticed there were some updates. She's running a blog now too, actually it's where most of the action happens. 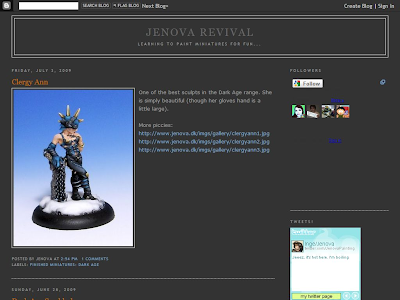 Quite appropriately it's called Jenova's Revival. I'm really amazed by the amount of miniatures she has painted, and the quality level she manages to achieve. It's great to see someone making a comeback like this. Anyway I'm very glad to see someone from the old gang picking up the brushes again. Inge, good luck with your comeback! Due to the boiling hot weather of the last couple of weeks I didn't really get much painting done. But here's a small update on the progress. I'm currently almost done shading the entire model. I did this with slightly dilluted Vallejo black wash. The sides and the tail part still has to be done. As a proof of concept I already painted the canopy a bit more. After the shading I cleaned up the mistakes and proceeded with 3 layers of drybrushing, each one having more Vallejo Model Color Silver White mixed in with the base coat, the last one being pure Silver White. I'm quite happy with the result. It's quick and easy and looks more realistic than my usual, traditional highlighting technique, which would take forever on this model. My plan is to add some weathering and rust to the canopy and then this first bit is finished.